Now, I don’t know much about Camus, but have read The Stranger and remember coming away from that with a disquieting sense of having learned something about the world I didn’t really want to know. The thing is, Camus seemed to specialize in the utter randomness of things; that abyss of meaninglessness that can cause one to stare morosely into one’s drink and question what the point of anything is. What struck me about the article wasn’t its tone or tenor, but the simple description of how Camus died. On January 4, 1960, the car he was in left the road at high speed, killing him instantly at the age of 44. In his pocket was found the train ticket he hadn’t used after accepting the lift to Paris. How random this decision, and what a tragic outcome. One can only hope he would lift a glass in appreciation of this final absurdity. This entry was posted in Philosophy and tagged albert camus car crash, albert camus death, philosophy now camus, philosophy webcomic, ray cavanaugh by simonandfinn. Bookmark the permalink. I wonder at the reason/s he decided not to take the train. His life, to that point, already made an indelible impact on the mind then, and into the future. Indelible is a great way to describe his impact. That unused ticket in his pocket was one of those enigmatic sliding doors, I guess. I was struck by its beauty as well.. the invincible summer of human hope. Great post. Not enough people talk about him. I’ve read quite a bit of his work (I highly recommend “The Fall”–it’s enough to potentially change the way you think about society), and perhaps I can offer some insight that might make his brand of Absurdism seem a little less dour. Camus was obviously in the company of Sartre, each of whom had lived through both world wars, and fought their respective urges to give up on humanity by adopting similar, but mutually distinct philosophies. 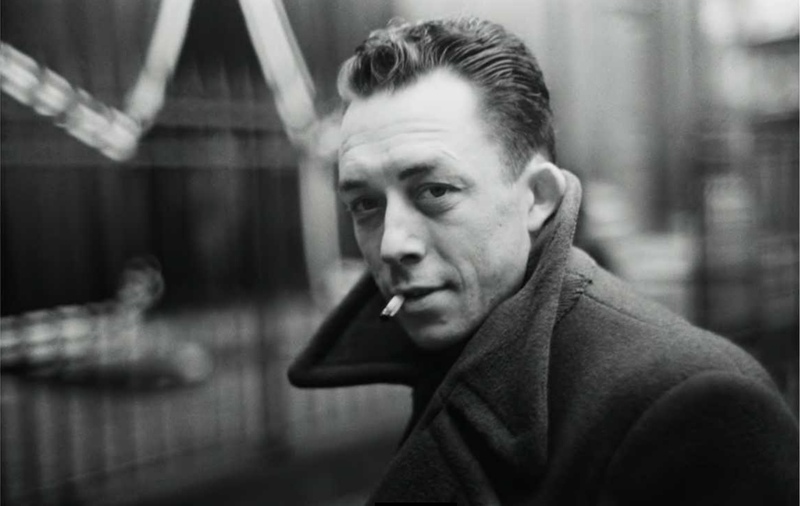 The key to understanding Camus is realizing that everything in his ethos is rooted in his attachment to the myth of Sisyphus (which lent his treatise on Absurdism its title). In Sisyphus–the fallen king fated to forever push a boulder up a hill, only to have it tumble back down–Camus saw the perfect metaphor for modern civilization: Fighting wars in the pursuit of world peace, only to have that boulder of armistice tumble back down into another armed conflict. Certainly, that must seem like a most pessimistic worldview, but Camus found hope in it. This indirectly ties in to the quotation you selected–both of them are to say that in the absence of any ability to change our state of existence, we must accept it, and learn instead to take joy in the act of finding meaning in our seemingly pointless struggles. For my money, his was the most beautiful and hopeful philosophy of all, though it requires no small amount of soul-searching and self-honesty to comprehend it. Thank you for your comment! I’m glad you liked the post. I haven’t read The Fall but am midway through The Stranger, so that is next on my list. That’s a beautiful quote you provided – as well as interpretation of it. Oh, my pleasure. Without Camus, there would be no Samuel Beckett, or Tom Stoppard, or perhaps even Monty Python–all huge influences on my work–so I’m always eager to get the word out about him. Well the word is definitely appreciated! Hmm… I think both would stand to reason.. 🙂 But absurdity and the abyss – as always – would reign supreme. Thought can look into the depths of the abyss and have no fear. Hi Lexmat – I love Bertrand Russell… I’m not familiar with that quote, but thank you, it’s beautiful. Funny enough I posted on something like that very recently, in terms of Nietsczhe’s abyss, but his words seemed to caution against looking into the abyss. Your cartoons are simply but, delightful. Philosophy is a serious matter, but you can make it entertaining to the profane with your lovely characters. How kind! Thank you, I’m so pleased to hear you think so. We all have a train ticket in our pocket. Choice is nearly infinite in our part of the world and that can be a lot to get our heads around. I strive to remember to trust myself, forgive myself and to never lose touch with my invincible summer. … and keep one’s drink topped up! Your comment and that video is beautiful and so perfect really… thank you ! Cheers to you, Jonathan Swift. The freedom to think is the courage to run into your demons. The best way to get out is always to jump inside. Those are powerful – as well as evocative – quotes. Thank you for taking the time to write them here!